Leucanthemum ‘Daisy May’ is a stunner. A large flowering Shasta Daisy. To see the plant in flower is to believe in the value of daisies in modern gardens. The colour is a vibrant white with a distinct yellow centre. Flowers are held on strong stems well above the foliage. As the flowering progresses buds appear from the stems below the original blooms which mean that the plant has a long flowering period. It is an excellent cut flower with good keeping qualities in floral arrangements. ‘Daisy May’ makes a statement in gardens and pots. The flowers of ‘Daisy May’ stand strong in the garden landscape even in full sun and will stand somewhat exposed conditions. ‘Daisy May’ will attract butterflies to your garden. Leucanthemum ‘Daisy May’ has as its ancestral line Leucanthemum superbum, the well-known Shasta daisy of our grandmothers gardens. ‘Daisy May’ comes to gardeners from the breeding programme of Walters Gardens Inc. who are top perennial commercial growers from the USA. 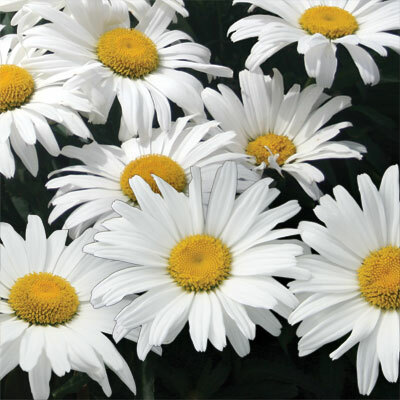 ‘Daisy May’ was selected by the breeder for its ease of growing and flowering and its tidy habit in the garden. No staking is needed as this charming perennial is so sturdy. Another selection criterion was the flower size and number. Flowers are massed and are up to 20cm in size. ‘Daisy May’ makes a great statement in mixed garden borders where the emerald green leaves look good. Major flowering in Australian and New Zealand gardens is from spring through to autumn. In gardens, plant in sunny areas but some semi shade is tolerated for at least some of the day. Gardens are ideal situations for ‘Daisy May’ but make sure that soils are well balanced with moderate amounts of compost worked into the beds. To make a good show in large pots a top quality potting media is beneficial. Good drainage is essential. ‘Daisy May’ makes a great cut flower for use in indoor floral arrangements where the blooms last well. All Leucanthemums are easy to grow in most regions across Australia and New Zealand. They have grown well here in our sub-tropical gardens but will also enjoy cooler conditions and even tolerate some frost where they will thrive and flower well. Dead heading plants will prolong flowering times as it encourages more flowers to come through. It is beneficial to mulch around the plants with most mulching materials being suitable. Once established water needs are not high. Water well when soils are drying out but do not overwater. As the plant ages you can dig it up and divide to rejuvenate the plants growth. Divide the root ball and shorten the leaves, plant and water in well to help it re-establish. Pest and Disease issues are minimal.